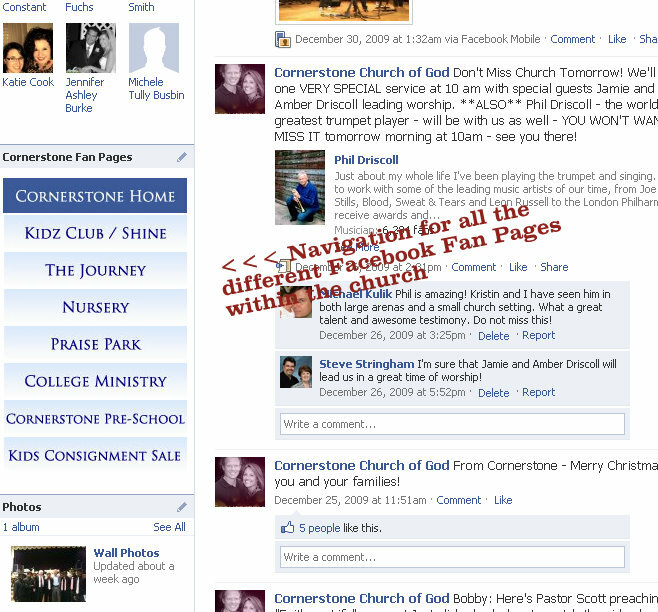 One of the most exciting places I’ve had the honor of working with Facebook Fan Pages is with our church! I’m always intrigued by the way businesses, Hollywood stars and other brands use Facebook Fan Pages. But the church (any church) just seems to have the right chemistry to leverage Facebook Fan Pages in some dynamic and exciting ways that other “brands” can’t. One of the ways a church can use a Facebook Fan Page – and how our church is using them – is by creating a Facebook Fan Page for each major ministry and group within the church. We’ve actually created a navigation bar that resembles a common website and links all of the ministry Fan Pages together (see image below) – you can also visit the Facebook Fan Page here and then click any of the other pages to see it in action! Each of the main ministries within a church can really take on a life of their own. And a Facebook Fan Page for each ministry allows communication and collaboration in ways that have previously not been possible. As you can see, we’ve created (so far) 8 Facebook Fan Pages, and about 4 or 5 more could be coming very soon. We are wanting to create a Facebook Fan Page for the 50’s and older group – and we think it will be VERY popular among it’s members and fans. 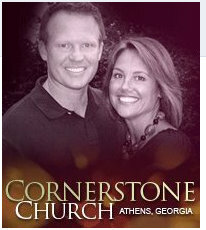 Another neat way that we’ve started using our churches’ Facebook Fan Page is by adding sermons via video. I was just talking with our video editor today and he told me that he’s seen an substantial increase in the number of viewings that the videos are receiving since we started adding them to our Facebook Fan Page. So that you can get the idea of how we use the Facebook Fan Page with videos, I just added our sermon that our Pastor preached just before Christmas. So as you can see, there are an endless amount of ways that a ministry can utilize a Facebook Fan Page. The communication (broadcast messaging) and real time collaboration is enough to make it worth having a Fan Page for your church. Not to mention all the other cool things you can do like adding video, photos, discussions, and real time feedback / comments from fans.